As fearsome as they were, even Viking warriors were not above wearing helmets. 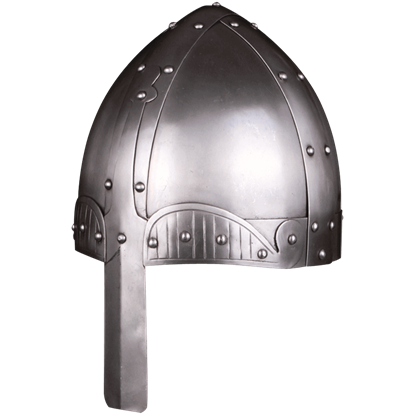 And here in this section of Medieval Armour, you'll find not only all of our Viking helmets, but also all of our Norman Helmets and our Anglo-Saxon Helmets, as all three of these peoples favored head protection that descended from a single, common source. Many of our Viking helms are remarkably simple and straightforward, almost like the warriors who favored them. Many Norse helmets in general, actually, replicate the traditional spangenhelm or the Norman helm, both of which were designed with protection first and appearance second. Not all of our Viking helmets are so uncomplicated, though. Some, like the Coppergate helmet, are designed to be ornate and impressive, while others, like the Viking winged helmet and the Sutton Hoo helmet, are impressive shows of Viking style that were no doubt designed to intimidate and inspire fear. 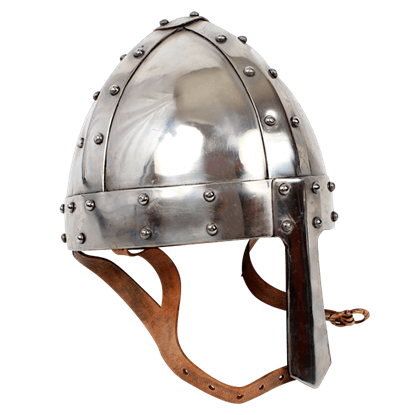 Most, if not all of our Viking helmets are also steel helmets, and many of them are designed to take a few good knocks, meaning that they can be used as reenactment helmets and SCA helmets with ease. We even offer a few Viking horned helmets, because even though they didn't actually wear them, nothing says 'Viking' like a pair of horns on your helmet. 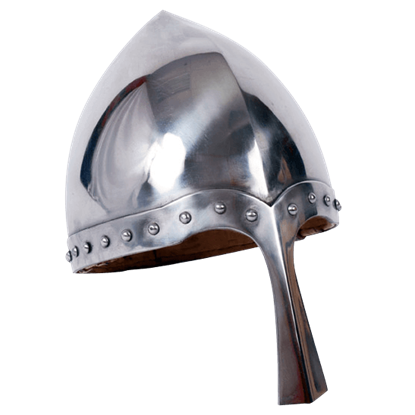 Historically accurate and fully functional, the Viking Helmets and Norman Helmets offered here at Medieval Armour are all a great choice for any warrior to wear whenever they plan on going into SCA combat or reenactments, as well as great display pieces for any Viking enthusiast to show off and enjoy. 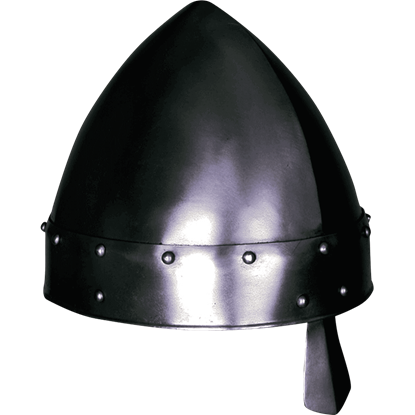 This style of helmet was commonly used from the 6th to the 12th century, due in part to its effective and straight-forward nature. 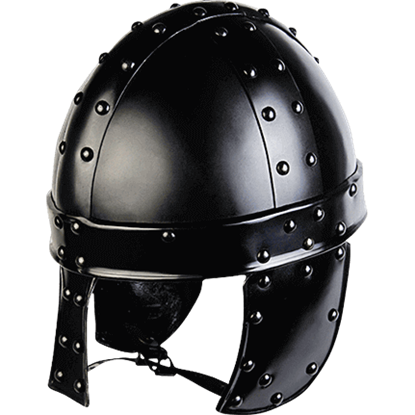 That makes helmets like this 14 Gauge Steel Norman Helmet quite iconic, and instantly recognizable, too. The Vikings were walking proof that you did not need to have an overly complex helmet to keep your head safe. 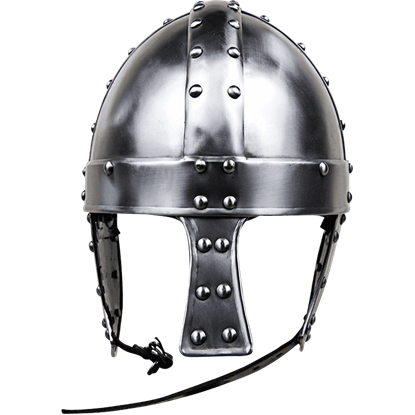 This 14 Gauge Steel Viking Helmet is a modern-day reproduction of the same helm that Viking warriors would have favored. The design of the fine Viking helm is based on fragments found at ancient Viking burial sites. The Sutton Hoo Viking King Helm is full sized and wearable. 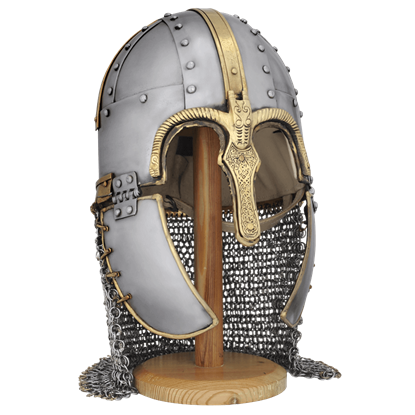 This Viking helm is crafted from 18 gauge steel featuring brass accents. For your next knightly excursion, top off your armoured look with the Alwin Steel Bascinet. 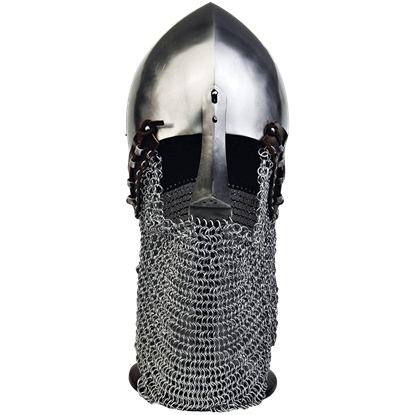 This handmade steel helmet covers your head as well as your neck with its attached chainmail neck curtain, called a camail or aventail. 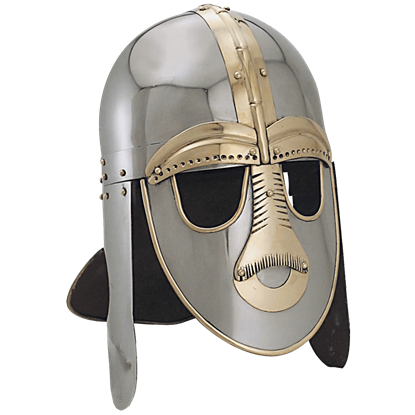 This historical Anglo-Saxon Helmet style dates back to the 6th Century! 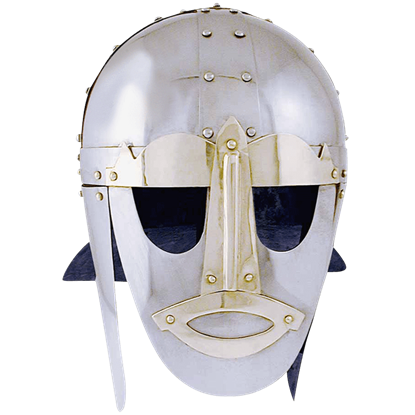 Our Anglo-Saxon Helmet dates later into the century and is handcrafted by skilled armorers from 18 gauge steel, with brass accents to emulate the original. When combined with a chainmail coif and padding the Baldric Darkened Norman Helmet increases your defense during LARP battle. Its classical design developed across Western Europe from the 9th century into the High Middle Ages. Modeled on the historical helmet style popular among the Norman peoples of Northern Europe during the Middle Ages, the Blackened Eindal Norman Helmet features a conical shape and a distinctive nose guard riveted to the forehead. The Tapestry of Bayeux depicts the knights and guardsman of William the Conqueror. On their heads rest Spangenhelms similar to the Blacwin Darkened Norman Helmet, a perfect fit for those who wish to reenact the Battle of Hastings. The Tapestry of Bayeux depicts the knights and guardsman of William the Conqueror. 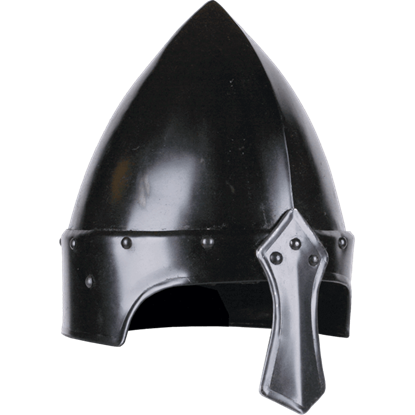 On their heads rest Spangenhelms similar to the Blacwin Steel Norman Helmet, a perfect fit for those who wish to reenact the Battle of Hastings. Named after Bragi, son of Norse god Odin, the Bragi Steel Helmet is inspired by historic Viking helmets. Curved and riveted plates along the helmets front bottom edge add an extra touch of style to this handmade steel armour piece. This skillfully hand-crafted pre-13th century helm gets the name Camail from the meaning curtain-mail, in which a protective curtain of chainmail is hung from the helm. 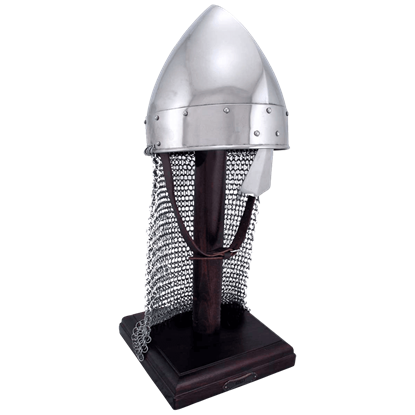 Our wearable historical life size helm is made of 18 gauge steel. The Coppergate Helmet was recovered during excavations in the ancient city of York in 1982. The Anglo-Saxon helm is of archeological importance. The inscription on the crest is an invocation for protection from the helmets owner.